Duranta erecta ‘Geisha Girl’ or Skyflower is hardier and not as weedy as the other species. Since it is easily propagated via stem cuttings, it’ll be wonderful to present gifts to neighbours and friends. This beautiful plant has been identified as an environmental weed in Australia, South Africa and China. 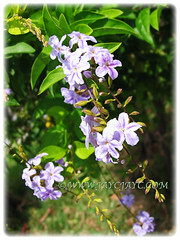 Botanical Name: Duranta erecta ‘Geisha Girl’ (syn. 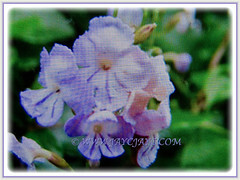 : Durante repens, Duranta plumieri, Duranta ellisia). Common Name: Pigeon Berry, Golden Dewdrop, Skyflower. Etymology: The genus name Duranta is named after the fifteenth century Italian botanist, Castore Durantes, while the specific epithet erecta means upright in Latin. Origin: Native from Mexico to South America and the Caribbean. 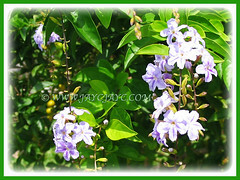 It is popularly cultivated in the tropical and subtropical regions worldwide. 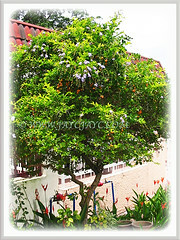 Plant type: An ornamental, flowering and perennial shrub or small tree. 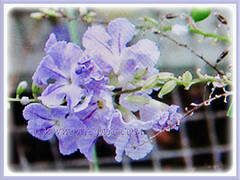 Features: Duranta erecta ‘Geisha Girl’ is a sprawling shrub with drooping and trailing branches. 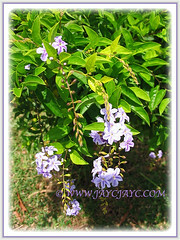 A fast growing plant that can easily reach between 1.5-3 m tall and spread as wide. Mature specimens possess axillary thorns which are often absent on younger specimens. The light green leaves are semi-deciduous, elliptic to ovate, opposite and grow up to 7.5 cm long and 3.5 cm broad with a 1.5 cm petiole. The leaves are sometimes toothed. 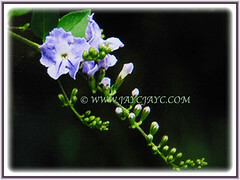 These delicately scented flowers (individual flower measuring 12.7 mm across) are light-blue, sky-blue or lavender. They are produced in tight clusters and located on terminal and axillary stems. They bloom almost all year long. The fruit is a small globose yellow or orange berry, up to 11 mm diameter and containing several seeds. Culture (Care): Duranta erecta ‘Geisha Girl’ or Golden Dewdrop is such an easy-growing plant and needs least maintenance. Moisture: Moderate water requirements. Water regularly. It can withstand drought when well established. Soil: Humus-enriched and well drained soils. Others: It tends to sprawl and will need regular thinning and pruning to keep it under control and shaped as a compact bush. 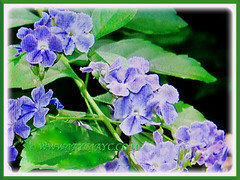 Moreover, this will encourage bushiness so that with more new growth or branches, you’ll get more flowers. Warning: Be aware that these attractive Duranta erecta’s berries and leaves are toxic and have been found fatal to humans, animals and possibly pet birds. Generally, it’s free of serious pests and diseases. However, do watch out for whiteflies and mealybugs. In Zone 8, Duranta erecta or Golden Dewdrop dies to ground after hard freezes but resprouts in spring. It typically recovers quickly enough to bloom, but probably not set berries by the following season’s first frost. It is sensitive to frost and extremely cold winters that can kill the shrub to the ground. However, it may recover and resprouts when warmer weather approaches in spring. Propagation: Propagate from seeds or from semi-hard stem cuttings. It can also be propagated by layering. 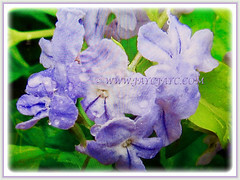 Usage: Duranta erecta ‘Geisha Girl’ or Skyflower with its beautiful pendulous clusters of flowers will be excellent as a fragrant hedge plant or screen. Since it flowers young, it is ideal as a lovely container plant on the patio, deck or garden porch. It can easily be trained as a bonsai or topiary for decorative purposes. It can also be grown on a trellis as a semi-vine. A magnet to bees, butterflies and birds especially the hummingbirds as a nectar plant.